RasterWeb! Ding! Session is Ready! Even though I’ve been attending BarCamp like events since 2006, and hosted Web414 for many years, I still hit these periods where I think that I have no right being in front of a crowd talking about something. Don’t get me wrong, I love to talk, and I love sharing my knowledge, but I occasionally question my own credentials. That brings us to WordCamp which happened this past weekend. I wasn’t very involved in the event (though I did help sponsor it) but during the planning I was asked to do a session, and I said “Sure! 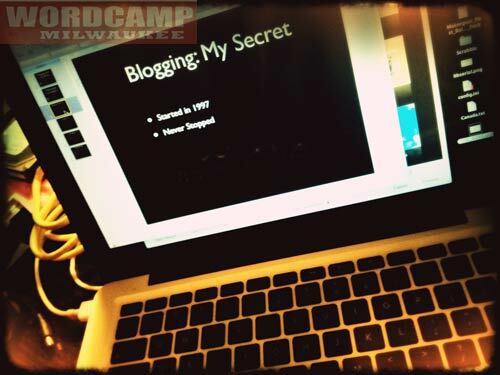 I can do a session on blogging with WordPress” which was the most generic thing I could think of at the time. How did it go? It went well. It went fine. It went… good. Yeah, it went good. I need to take my own advice. The thing I’ve told people time and time again at BarCamp events is “You are an expert at your own experience” and damn, that’s the truth. Seriously, that may be the smartest thing I’ve ever said. If someone is more of an expert at your experiences than you are, well, you may have a stalker, and hey, then you have experience being stalked! Here’s the thing… I just rambled on about my experiences blogging, and showed some of the blogs I write for, and some of the tools I use. There were questions I couldn’t answer. That’s OK. I asked other people in the room. I’ll never assume I’m the smartest person in the room, even if it’s just me and the cats. All I can do is share my own experiences. I can tell you what I’ve done, or what I think, and occasionally I can tell you the right way to do it, but even then, it’s going to come from my point of view. Also, it helps to yell and swear. I tend to do this when I talk to a large group. Someone from Chicago invited me to do a session at their WordCamp in the fall, and I had to confirm they actually saw my session. You know, the session where I told people interested in making money to get the hell out! I guess yelling and swearing works sometimes. So the good news is, you may not have to prepare for your BarCampMilwaukee session this year. Just show up and talk about your own experiences. If it doesn’t work, feel free to yell (and swear) at me. You’re welcome! Posted on Tuesday, June 5th, 2012 at 5:00 am. Subscribe to the comments feed. Both comments and pings are currently closed. Post on your own blog. Pete. Your presence, knowledge and experience was a great addition to the event.